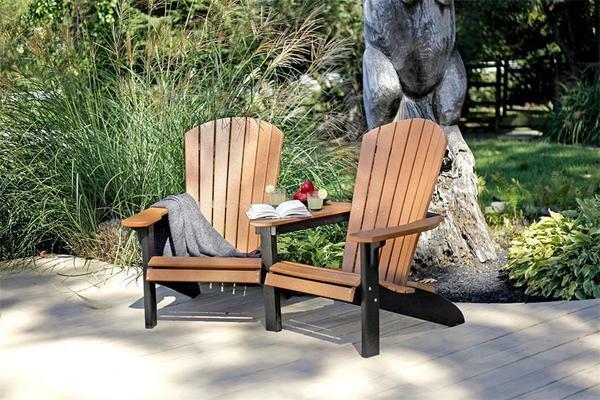 This Fan-Back Settee is crafted in a style that is very similiar to the popular Adirondack Style. Our Poly Settee is the perfect seating for two with a small table in between to hold drinks, snacks or reading materials. We offer a wide variety of poly colors such as Green, Burgundy, Weatherwood, Cedar, Brown, Black, Gray, White, Turquoise, Blue, Patriot Blue, Yellow, Red, Lime Green, Purple, Orange or combine any two for a truly unique look. Please call one of our Amish furniture specialists with questions on this American made poly settee. You and a friend can relax in style and comfort with our Amish poly fan-back settee! This outdoor furniture item takes between one to three weeks to receive. No Splinters, Splitting or Cracking- Always Smooth to the Touch! *Seat Cushions Are Available Upon Request. Please call one of our furniture specialists today for a custom quote.